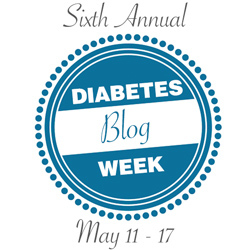 four sweet kids..two with diabetes: Sugar Free Rewards! I had a meeting yesterday with Mary Claire's grade level teachers about her diabetes and what to watch for, i.e. lows, highs, and the symptoms. I cried (not surprised?) when we talked about the reality of dying faster from lows than highs, pulled it together again, and we talked about management of lows and highs, field trips, and treats. I decided to decorate the handle with jillions of ribbons! (my favorite!) Then I added all the sugar-free stuff I bought: Extra key lime pie and strawberry shortcake SF gum, Trident watermelon gum, tic tacs, Extra orange and mint chocolate chip gum (wonderful, if you've never tried it!! But they were sold out of 3-packs! And..these new Icebreakers in Bubble Breeze (not guaranteed to give you date-worthy breath..unless your date is 15), and more fruity tic-tacs. Just lots of little treats that are 2 grams of carbs or under...requiring NO insulin! : ) Now, that's a treat! And..Mary Claire forgot to take it to school this morning. 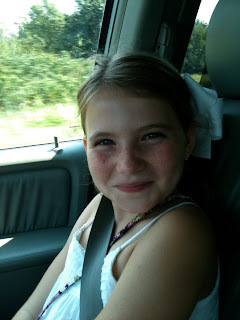 : ( So, I took it when I went to check her out to take her to the orthodontist to....get her braces off!! 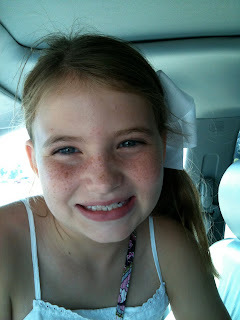 This is how she smiled right after she got her braces on, so no big surprise. After some coaxing...I got this! : ) Not all her teeth, but shiny, straight, white teeth! (and a flashy new pink/black retainer she's very proud of...and a new sound: constant sucking of spit.) Joy! Oh, Holly, I have missed you and reading about your family and your projects! You've done it again. This basket is so cute!!! Your creativity amazes me. I wish I had an ounce of your creativity. Happy Birthday to you and many more on Channel 4"
Mom..thank you!! We had fun today! thanks!! : ) hugs! New Shirt Design..and Still Going!